Look, Stewart is funny, wickedly funny. His timing, expressions and body language are the best. And the fact that his patter is politics only makes it better; I like politics, he makes political humor. But lot’s of people forget that the man is a clown. He’s an entertainer. He’s on a stage making people laugh at jokes. Think Abbott and Costello. Andrew Dice Clay. Rodney Dangerfield. He isn’t a commentator. He’s isn’t a reporter. He isn’t a writer. This entry was posted in Debt - Deficit, Economics, Economy, Idiots on Parade, Politics: National and tagged Debt Ceiling, Paul Krugman, Platinum Coin. Bookmark the permalink. pino, I think he’s at his best whenever he has the opportunity to make wicked fun of CNN. They are just genuinely silly in their endless self promotion and he nails it when he goes after them. He puts a little extra juice in when they’e the target. pino, I think he’s at his best whenever he has the opportunity to make wicked fun of CNN. I like it when he goes after Fox too! Brilliant. 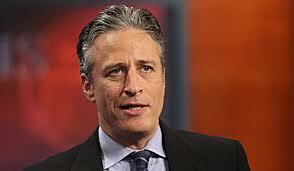 Jon Stewart is a breath of fresh air. Even if you disagree with him on items, he’s honest – his humor is focused at rooting out hypocrisy and idiocy wherever he finds it. He’s one person who on a few occasions has gotten me to change my mind on issues by clarifying the argument. Too bad our news channels can’t do that. Jon Stewart is a breath of fresh air. He’s one person who on a few occasions has gotten me to change my mind on issues by clarifying the argument. Uummmmm…….I go to Stewart for mind changing dialog like I go to a NASCAR race to learn differential equations.